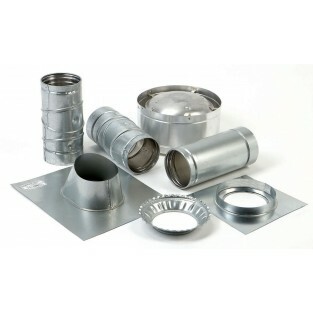 The Bosch Vertical Vent Kit (H/P VVT) is a 5" Galvanized, Type B Vertical Vent Kit. This vertical vent kit includes a 5" x 12" pipe, (2) 5" flexible 90 degree elbows, a 5" fire stop support, a 5" roof flashing, a 5" storm collar, and a 5" rain cap. The HPVVT Vertical Vent Kit is manufactured by Selkirk and is used only for the Bosch Therm 520HN, 520PN, Bosch AquaStar 1600H, 1600P, Bosch GWH 425PN and 425HN tankless water heaters.